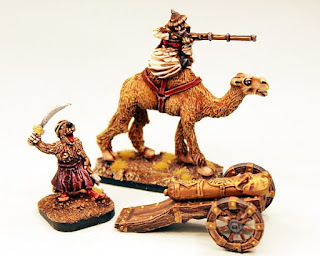 As many Flintloque and Slaughterloo players noticed over the past six weeks or so the Otharmann Empyre, land of the Sultan and the Othari, has been looking a little thin. Some codes and units have not been on the website and stocks have run out of them with our partners such as Noble Knight Games (if you are in the USA check out our vast ranges with them online) the reason for this was sublime and fun too. They have been replaced. They have retained their contents but with changes from white metal to resin and from some models to new versions of them. All of this updating was a part of our lead into the new projects for Valon but more on that later. For now go HERE to see the Otharmann Empyre or read on for details and pictures of what is now here. 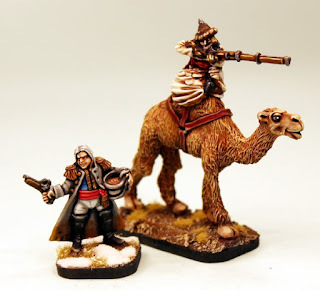 We have a brand new African Camel in 28mm scale in resin which you can purchase on its own and also now with two different riders one an Othari with Lance and the other an Othari with long Jezail musket. We have reduced the price of these models to reflect the new medium of production. Please note the Elf Officer shown in some pictures is there for scale and is not supplied. This pack contains one 28mm scale resin African camel which can be used on its own or with a rider or baggage in any game setting. Go HERE. This pack contains one white metal Othari Warrior with lance mounted on a resin Camel. This code requires assembly. The model when assembled stands 70mm tall from camel foot to the top of the riders head. Supplied with a resin cartouche style base. Go HERE. This pack contains one resin Othari Warrior with long primitive musket mounted on a resin Camel. This code requires assembly. The model when assembled stands 70mm tall from camel foot to the top of the riders head. Supplied with a resin cartouche style base. Go HERE. 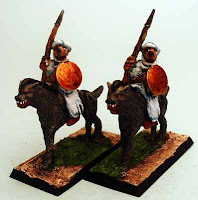 In addition to the new Camelry we have replaced the vicious Gnoll beast which the Othari use as a cavalry mount with a new resin version of the model which makes use of the existing riders. Here are the codes. 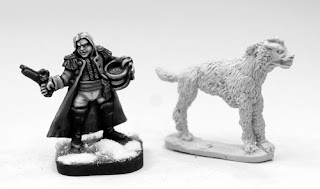 This pack contains one fantasy 28mm Gnoll in resin which can be used as a beast or as a mount in any game system or such setting. Go HERE. 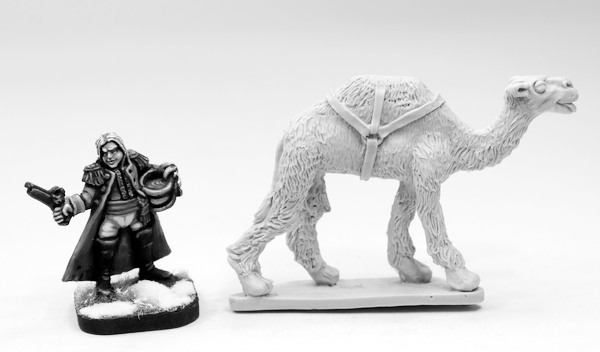 This pack contains two different white metal Othari riders on two identical resin Gnolls. An officer with Sword and a Standard Bearer. 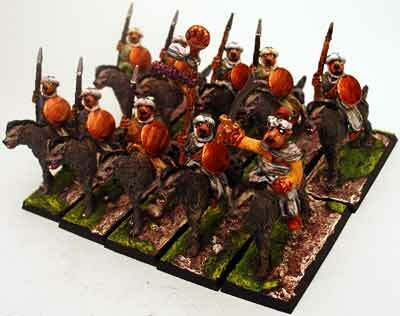 For leading your forces or units of Gnoll Lancers. Supplied with resin cartouche style bases. Go HERE. This pack contains two identical resin Othari riders with short lances on two identical resin Gnolls. 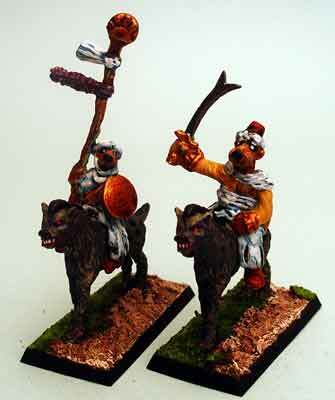 For your units of Gnoll Lancers in the service of the Sultan. Supplied with resin cartouche style bases. Go HERE. Riding vicious Gnolls at high speed these lancers sweep across the battlefield. Armed with lances and classed as Cavalry this unit contains ten riders, an officer, a standard bearer and eight identical lancer troopers all mounted on resin Gnolls. A full unit for Slaughterloo. Supplied with resin cartouche style bases. Go HERE. 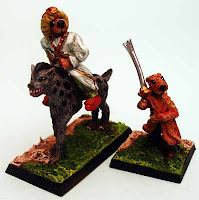 This pack contains a high ranking Othari mounted on a resin Gnoll along with an Othari Guard holding a two handed sword. Ideal for leading your Otharmann army into battle! Supplied with resin cartouche style bases. Go HERE. 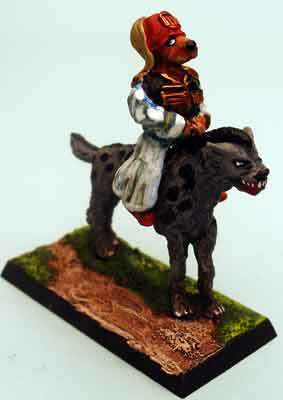 This pack contains an Othari mounted on a resin Gnoll. 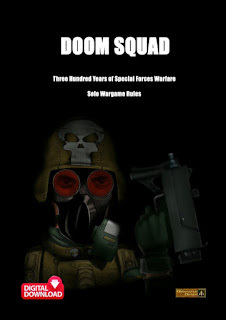 Ideal for leading your Otharmann Division. Supplied with resin cartouche style base. Go HERE. 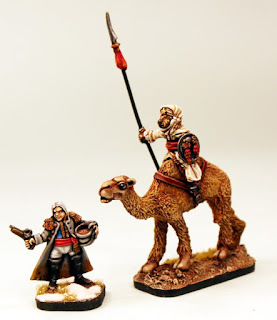 In addition to the new Camel and the resin Gnoll codes we have updated the flying carpet rider now into resin as well with a price reduction to boot! Riders on the Storm into this fray they are born. 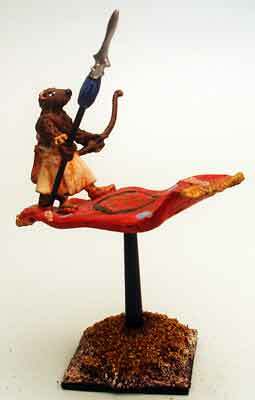 This pack contains one Othari Warrior armed with a spear and a bow along with a separate resin flying carpet and plastic flying base. Assembly Required. Supplied with resin cartouche style base. Go HERE. The Otharmann Empyre makes great use of primitive cannon which fire huge stone balls at their Elvish and Undead foes. We have updated the mighty Barking Dog Cannon with a resin body and a price reduction too! The Artillery of the Otharmann Empyre is known as the 'Barking Dogs'. Big and slow cannons that often fire stone balls as well as iron. 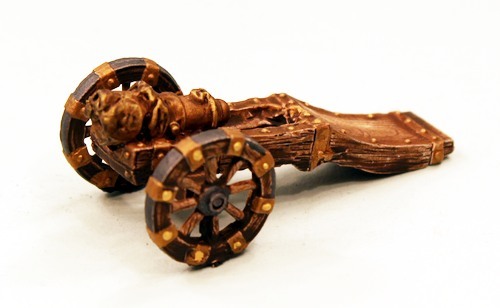 This is a specialised artillery piece. 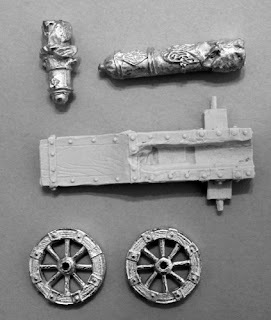 One Othari archaic cannon body in resin with two white metal Wheels and a two different white metal Barrels (medium or heavy). One Massive Specialised Field Gun Kit. Suitable for use with any Othari Army. Assembly Required. Go HERE. 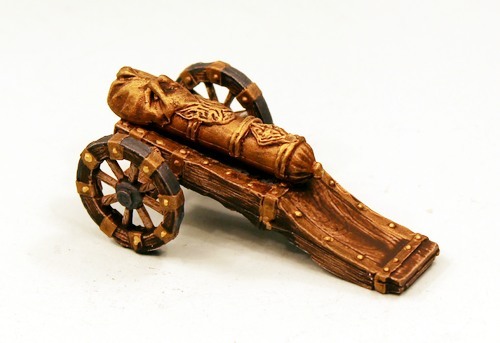 The gunners of the Otharmann are poor by the standards of the rest of Valon but they are plentiful and make good use of their Barking Dog Cannons. Limber Beasts are expensive so slaves pull the guns into position. 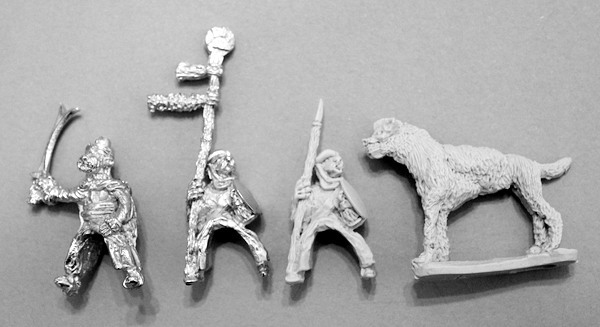 This pack contains an entire Othari Gun Crew of seven 28mm scale white metal miniatures. 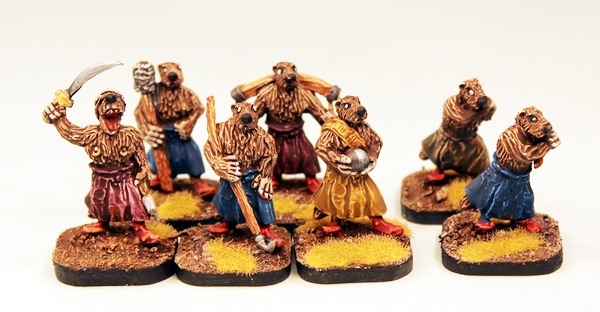 An Officer, Rammer, Ball carrier, Spike, Water Carrier and two slaves. You can add ropes to the slaves or use thread or metal wire (not supplied). Supplied with resin cartouche style bases. Go HERE. Lastly if you are looking to get an entire Otharmann division onto the battlefield for Slaughterloo then look no further than the now updated divisional army pack (DAP) as detailed here. Now with extra value! An Othari Division that fights in the dry lands of Aegypt against the Ferach Empire. Players of Slaughterloo or those wishing to make a saving to get a big collection in one go will find excellence here. Save Approx 20% off list prices on this Division! An Entire Slaughterloo Division in a box. Go HERE. All Hail the Sultan! Thanks for Reading. A Vast Amount of Free Downloads now online!